Many years ago when I was a small boy my grandmother, Elizabeth Moseley (neé Fellows) used to tell me a tale about her cousin Bill from Bridgnorth. 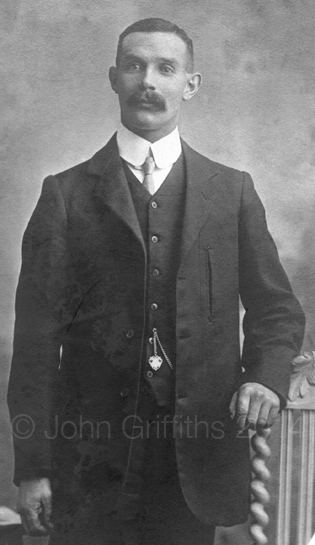 Bill was born William Henry Fellows on 8th September 1882, the fourth of nine children born to Benjamin and Isabella of Bernard’s Hill, Bridgnorth. Bill’s father Ben was the brother of my gran’s father Thomas who lived in Hospital Street, Walsall. Bill began his working life as a bricklayer’s labourer in Bridgnorth according to the 1901 census but 10 years later he was living in lodgings in Islington, North London and was now a prison warder at Pentonville Prison. The tale she told of Bill was his connection to the infamous wife murderer, Dr. Harvey Crippen. The tale my gran’ told was of her cousin Bill finding Dr. Crippen with his wrists slashed, using the broken glass from his monocle in an attempt to cheat the hangman from performing his duty. As the old adage goes “never spoil a good story with the truth”, that’s being a little cruel to my dear old gran’….she was almost right! Although Crippen was hanged in November 1910 it took until 1993 for the Public Record Office to release the details of the case, why the secrecy for a wife killer I don’t know. In an attempt to confirm or deny the story I contacted the PRO at Kew and received the appropriate documents a week later. It stated that Warder Fellows was escorting Crippen through the jail when the prisoner broke down and began crying for a full ten minutes and protesting his innocence at the same time. Crippen briefly went into a small recess out of sight of the warder who heard the sound of something breaking. He asked the prisoner, who had removed his spectacles (not monocle! ), to empty his pockets which revealed a broken pair of glasses. Another interesting comment from gran’ was that Crippen, minutes before the noose was placed around his covered head, spoke to Bill Fellows. Try as the family did, Bill never revealed to them what Crippen had said to him in the last minutes of his life. An even stranger occurrence happened in a film which I think was the 1963 production Dr Crippen starring Donald Pleasance as the evil doctor. At the end of the film one of the two warders escorting the prisoner leaned over towards Crippen who appeared to whisper something into his ear! How would the film production company in 1963 know of this fact if the documents appertaining to the case were still under wraps for another thirty years? Bill Fellows was still around when this film was made, did they ask him! Its fascinating to hear this John; I had heard this from my grandfather, William Brian Fellows (William Henry Fellows’ son) but its lovely to hear it from another source! Thanks for getting in touch, you are the first person, outside of my immediate (maternal) family, to corroborate this story so I am pretty pleased too. Several years ago I was in touch with Vincent Fearnall from Bridgnorth and he told me of your grandfather, William Brian and thought he lived in Wolverhampton, could you tell me if that is true? I know a Brian Fellows was involved with a society of some description in the Black Country as I used to see his name in the Black Country Bugle newspaper and often wondered if it was Bill Fellows son. Looking at the post tonight I never realised it was so short and to the point, I think I should add more info which I now have. Bill seniors story was in the Daily Mirror, and other newspapers, in 1992 when it was released into the public domain after 80 years, I also have the Governors report from Pentonville Prison telling of Bill’s exploits with Dr. Crippen. I will add some of these items to the post in the next couple of weeks so maybe you would like to have another look at the additions. « A nice little earner for a damp Tuesday in June! You are currently reading A granny’s tale at Walsall Life.